So, it’s coming! The world of dinosaurs, pirates, and Meso-American warrior princesses is here, and it’s my job to make sure you’re all prepared for our prerelease events! First things first–Check our schedule for the start times! Our events are hosted at our Overland location, and you can always get a quick response from our Facebook page! Each event is $25, and you’ll receive one of these super awesome prerelease kits!! Wizards of the Coast has more information on that in their Prerelease Primer article, and some really great deckbuilding tips if you’ve never played a Sealed event before or you just haven’t played often. All About Games is doing a few really cool things this time around! 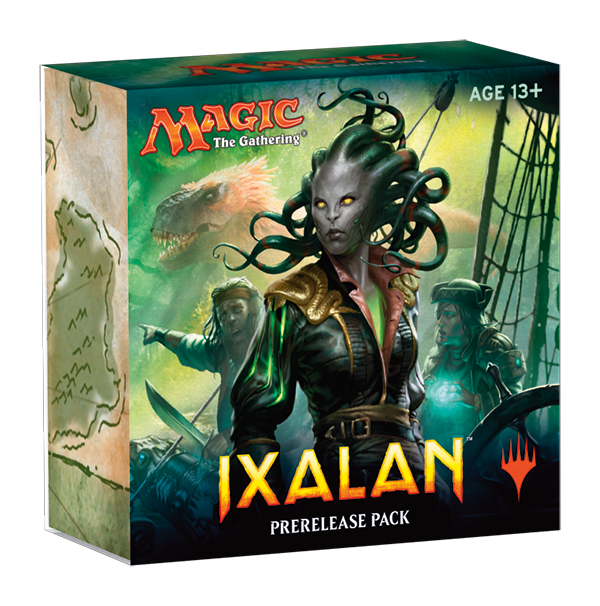 We know prerelease can be expensive, and some of you have been saving up for months, so we’re doing an Iron Man/Gauntlet as a huge thank you for exploring the jungles of Ixalan with us. If you play in five of our prerelease events, we’ll make sure you get into the sixth one free–no charge at all!! This is a really great deal for those of you who make an entire weekend of it already, and just a little more incentive to keep coming back. Our Midnight Prerelease event is going to also be a COSTUME CONTEST!! Yeah, you read that right! Show off your swashbuckling pride, suit up with the warrior poet Huatli, freshen up those merfolk gills, or just be a dinosaur! We’re going to be giving out prizes to one winner in each of three different categories, voted on by all of our lovely prerelease participants! Please be respectful with your costumes and make sure they are store and family friendly–while it would be SUPER cool to be a dinosaur-bitten pirate, we would like to avoid having to clean up all the red stains your costume leaves behind! Don’t have a costume–some local stores have their Halloween sections set up already, so check them out or just throw something fun together with what you’ve got! We are so excited to see what everyone comes up with! We’ve got a compass to lead you directly to prizes, a dinosaur target range, and more fun stuff that we’ll have set up to keep you guys busy between rounds! It can get exhausting waiting, and downtime is something you want to avoid when you’re already getting sleepy. Plus, you’ll have more chances to win awesome prizes in the form of Ixalan boosters, Planeswalker decks, Bundles, and maybe even a booster box!! These are always available in the store, but we want to remind everybody that they exist! Snack Packs are $5 and come with one booster pack, a can of soda, and crackers or two Airheads! It’s a little boost of sugar for a great deal if it’s getting late into round three and you need a quick pick-me-up. We also have hot pockets, chicken bakes, single-serve pizzas, energy drinks, and K-Cup coffee servings that you can buy! We’ll still have free drip coffee out, so don’t worry about losing out! Depending on turnout, we usually order in a few pizzas too! This is something that I always ask myself prerelease weekend–because no matter how prepared I think I am going into FNM a few hours before the midnight event, I am always scrambling. The great thing about prerelease kits is that they already have the essential parts–a d20 and the cards to build your deck with. That’s really all you NEED. Besides, take a look at this gorgeous thing! So pretty. But there are some things that make prereleases smoother, or just more fun! It’s a bit wordy, because I’m a bit wordy, but you can skip everything except for the first few words of each point if it makes you feel better! Carrying Case. Your prerelease kit is deckbox–all of your cards will fit in it. But if you’re like me, you carry around more than that. I have an old fat pack box from Theros that I keep everything else in, and use my prerelease kit box just for the deck I’m playing that event with. Sleeves. Forget the damage you could potentially cause shuffling your cards unsleeved and think about this: Ixalan has double-faced cards. If you’re not playing with sleeves, your opponent will be able to see the back side of that card when it’s on top of your deck or in your hand, and you just don’t want to give them that kind of advantage. Ultra-Pro, Mayday, Legion, and Dragonshield sleeves are all available in packs of 40 and 60, so let them help you preserve your card value. Playmat. Playmats are just cool and convenient. If you don’t own one, pick one up at the store or try shooting for first place in an event and win one of our personalized prerelease playmats! Extra Dice/Counters. With Amonkhet and Hour of Devastation, we had to keep track of a lot–token changes, -1/-1 counters, brick counters, and massive amounts of life gain! The punch out tokens that came in booster packs were great, but limited and can be looked over easily. 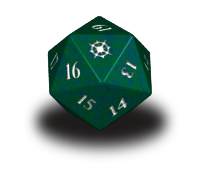 To make it easier for both myself and my opponent to understand the battlefield, I use several d6’s to keep track of everything. I use red dice for negative status effects, and green for +1/+1 counters and positive effects. We’re going to be creating a lot of treasure tokens, so it might be useful to have at least one other die to keep track! We have sets ranging from $3.99 – $13.99 in the store or you can choose from our bulk bins for $0.75 each.